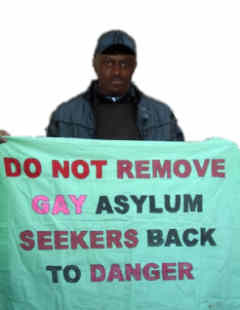 A gay asylum seeker, Uche Nnabuife, which the UK plans to remove Wednesday 20 April has been directly threatened with death according to an article in a Nigerian newspaper. The newspaper 'National Times' is published in Makurdi, capital of Benue State in North-central Nigeria, but circulates nationally. According to Rev Rowland Jide Macauley, a gay Nigerian priest and activist based in London but who travels to Nigeria, the threat "will circulate". The article said that Nnabuife would be subjected to "jungle justice" if returned and "his body would not be found." 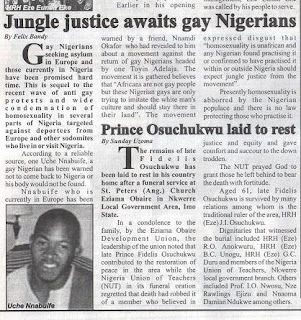 It claimed that a movement existed against the return of gay Nigerians headed by Toyin Adelaja. It said that "homosexuality is abhorred by the Nigerian populace and there is no law protecting those who practice it." 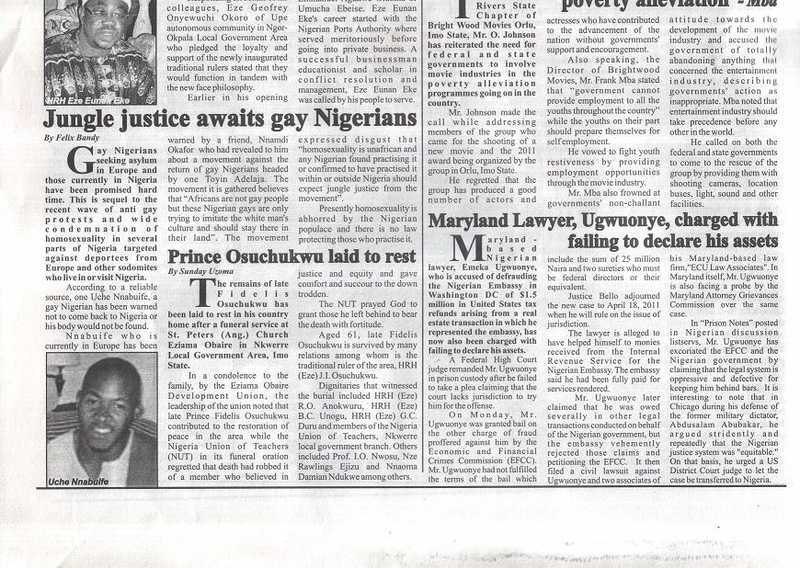 "This is an important media report on the negative onslaught of LGBT people in Nigeria. 'Jungle Justice' in Nigeria is a serious problem, people take the laws into their own hands and for the headline to read such, we truly have to give this all the possible worst interpretation." "This is similar to the Uganda 'Hang them' newspaper report and I believe we should do more, act on this because no one is safe with the newspaper actions. This is a clear incitement of hatred towards gay people." A number of Ugandan tabloids have published pictures and names of addresses of people, including non-gay people, named as gay or lesbian and subsequent attacks on them have been documented by human rights organisations. Nnabuife has also been personally targeted in comments on the Internet. "Yes he will be killed jo! ....Not that I personaly condone killing...but the reality is that we still live in a culture and environment where such is GREATLY frowned at! he will be Jugded everyday of his life!...tell me if he cant walk freely with another man hand in hand? NEVER!!! at least not if he is in Nigeria!...they will pass judgement on him right away....okada boys/area boys will strip him naked and put tire on his head and parade him...and who will stop them...NOBODY!!!!" "Linda, remeber that article you shared on your blog about one couple praticing infidelty and they were caught and paraded naked?...imagine that o!!! Infidelty is wrong but who are we to judge?....what happened to those couple will be nothing compared to if those type hypocrite Nigerians catches up with them....."
"Nigeria is as BACKWARD as their fellow Uganda allys in issues like this...Infact show me an African country that can condone such and I will show you a three legged man!" Nnabuife has been detained at Haslar Immigration and Removal Centre, near Portsmouth, since November 2009. Despite his ex-boyfriend and other close friends having testified on his behalf that they know him to be gay this has not been believed by either the Home Office or immigration judges. This is believed to be in part because he has a conviction following being found in house which had cannabis in it. That has led to the consequent dismissal of his sexuality claim as not credible. In addition, sexuality claims by Nigerians and other Africans in particular have been reported to be regularly dismissed by the Home Office, according to a report by LGB rights charity Stonewall. And foreign nationals with a criminal conviction are now subject to indefinite detention and presumption of deportation. The conviction has also meant that Nnabuife's MP, Labour Party Deputy Leader Harriet Harman, has refused to support him. A number of other gay Nigerians are believed to be being held in UK detention, having had their asylum claims rejected because they are not believed to be gay. Hope Nwachukwu was picked out as gay by other Nigerians and physically harassed in a detention centre. He has since won release on bail and reconsideration of his claim but the Home Office refuses to believe he is gay. One lesbian deported back to Lagos last November now sleeps rough and begs for food because she has no family support and had to bribe her way out of airport police detention, meaning she had no money. Whilst in the UK she was able to support herself and rely on friends and the gay community. Macaulay visited her earlier this year and said she has suffered immeasurably, including being raped. “She is in great fear of connecting with her family who are aware of her sexuality, unable to access medical care and other basic amenities. She is afraid,” he said. Nnabuife has remained in detention having had a bail application refused by a judge that has found unfavourably in a number of cases of gay detainees. Last week Medical Justice sent a doctor to meet him and produce a report, based on a physical assessment of his scars to support his description of the events in Nigeria which caused him to flee. In 1990 Nnabuife was discovered with another man and was strung up, badly beaten, burnt and abused leading to several weeks in hospital. He saved money to leave the country, working as a male prostitute, where the property that he was living in in Lagos (the city which the UK wants to return him to) was attacked. Fearing for his life, he arrived in the UK in 2005. "Uche just wants his voice to be heard. He is gay, all of his friends know him to be gay. Yet, he has been forced to live in an environment where he is afraid to admit his homosexuality and has no freedom. He would like the government to remember that he is a human being and deserves a second chance to live his life in peace, without threat of torture or worse in Nigeria, which is the reality he faces if deported."